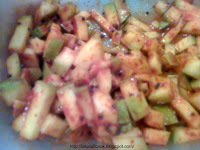 Mango Pickle is one of the most tempting side dish as far as I am concerned. Most of the Indians, especially in Andra, love spicy food and Pickles are no exception. Even they say that pregnant women love mango pickle and consume more of mangoes in their first and second trimesters. There are different varieties of pickle and I mostly have store bought mango pickle at my home. I have always wanted to make mango pickle at home. To start with, I tried a very simple version of mango pickle. In future I am planning to do homemade mango pickle, the difficult version and will surely share the recipe. Here comes my easy version of mango pickle. Mix the chilli powder, and salt with the mango pieces. In a pan, add oil and mustard seeds. When the seeds pops add hing powder. Add this to the mango pieces and mix well. Refrigerate it in an air tight container for a day and start using it. Are you waiting for more steps? Then I am sorry. That is all as far as the method goes. It is such an easy preparation that no one would hesitate in preparing it. This pickle tastes even better the next day of its preparation. Mango pickle goes well with curd rice or even chapatti. This just reminds of my school and college days. I used to take this with curd rice. Nothing can beat the taste. How long can mango pickle be stored? Should it be refrigerated? Also, what about store bought mango pickle?